The current story line for Young Justice has jumped from here to there. Four months the book has been published but the story has only been going on about a day to two days. Month after month it’s hard not to get lost in the story. Issue #4 focuses more on the political side of Gemworld. It helps build the internal struggle and gives Young Justice something to fight for…eventually. 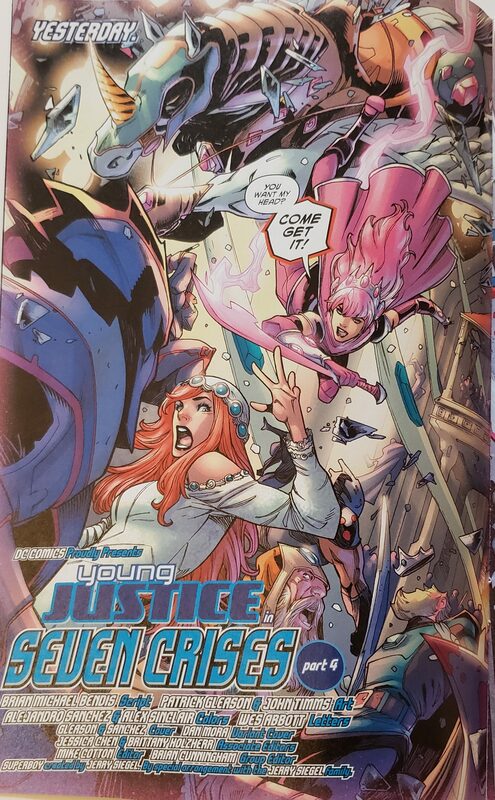 The Young Justice gang have been scattered around the various parts of GemWorld. It seems Conner/Superboy has been living there for sometime. His presence is a welcome sight and a bit shocking considering the circumstances. The truth be told. It’s nice to see Conner cut loose here. Bendis has real grasp on the characters. Impulse is perfect and brash like we’ve come to know. The new characters here: Amethyst, Jesse Hex and Teen Lantern are slowing finding their place. The story is set in GemWorld so Amethyst is the focal point. Jesse Hex’s truck unfortunately sets the next danger for our team. It makes the story a little interesting and a tad confusing. The final page leaves tons of speculation for the issue. Gleason’s art is top notch like always. I still think he’s having tons of fun on this book. I can’t wait to see what happens next.